Did you know that North London Cares is a charity? Without the sustained generosity of our supporters, partners and sponsors, we would not be able to continue. Bequests from individuals will help ensure the future work of North London Cares. Legacies will not be used to expand our administration, but will exclusively benefit and develop our core activities. 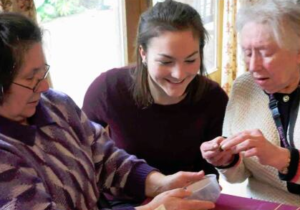 By remembering North London Cares in your Will, you will help fund our social clubs and Love Your Neighbour project, allowing your neighbours feel valued, loved and supported for years to come. After family and friends are looked after, you could choose to leave a pecuniary legacy (a specific sum of money) a residuary legacy (the remnants of your estate) or a percentage of your remaining estate to North London Cares. Legacies to charities are tax-free and therefore by leaving a gift to North London Cares, your tax bill may be reduced. You may request a specific use for your legacy – such as to help fund a specific social club, borough or activity – or allow North London Cares to decide how the gift is used so it can be put to best use when received. If you wish to designate your gift towards a specific area of our work, please discuss this with us and then specify it in your Will. Any gift would be generously received and greatly appreciated.